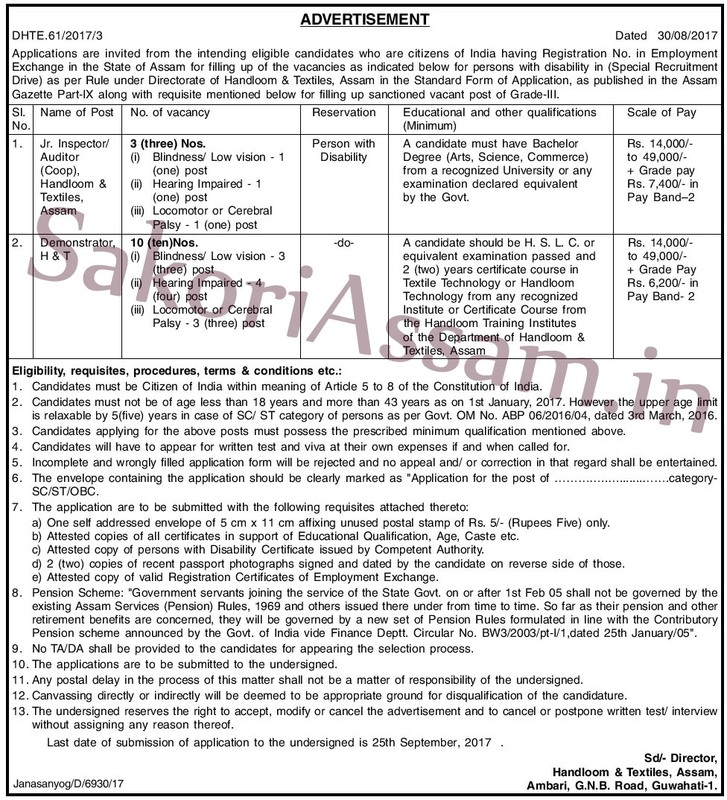 Assam in the Standard Form of Application, as published in the Assam Gazette Part-IX along with requisite mentioned below for filling up sanctioned vacant post of Grade-III. Educational Qualification: A candidate must have Bachelor Degree (Arts, Science, Commerce) from a recognized University or any examination declared equivalent by the Govt. Name of Post: Demonstrator, H&T. Educational Qualification: A candidate should be HSLC or equivalent examination passed and 2 (two) years certificate course in Textile Technology or Handloom Technology from any recognized Institute or Certificate Course from the Handloom Training Institutes of the Department of Handloom & Textiles, Assam. Age: 18 to 43 years as on 1st January, 2017. However the upper age limit is relaxable by 5 (five) years in case of SC/ST category of persons as per Govt. OM No. ABP 06/2016/04, dated 3rd March, 2016.
a) One self addressed envelope of 5cm x 11 cm affixing unused postal stamp of Rs.5/- (Rupees Five) only. Last Date: 25th September, 2107.